Asbestos is a group of minerals that occur naturally in the environment as bundles of fibers that can be separated into thin, durable threads. There are two main types of asbestos and both have been linked to cancer. A. Chrysotile – This form is a serpentine or curly asbestos. When viewed under a microscope, it’s clear to see that the fibers wrap around each other in a spiral formation. 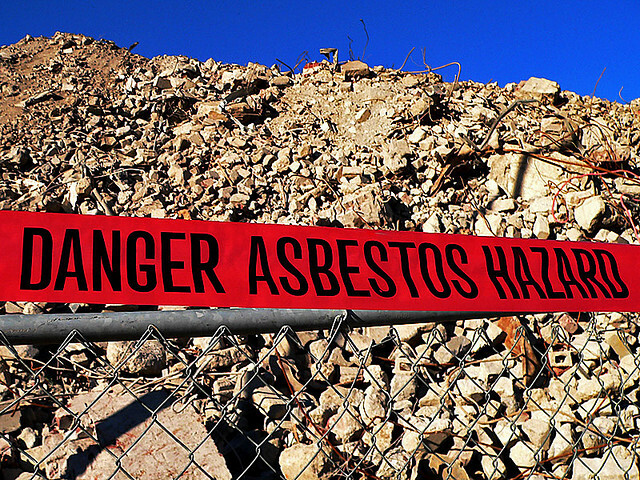 It’s also known as the white asbestos and is most commonly found in industrial products. B. Amphibole – This form has straight and needle-like fibers. There are several forms of this type of asbestos including tremolite, actinolite, anthophylite, amosite (brown asbestos), and crocidolite (blue asbestos). Because the fibers are strong and resistant to heat and chemicals, asbestos was commonly used when producing insulation material. However, studies have shown that breathing in this product causes scarring of the lungs and has been linked to cancer. It has since been banned; however, it is still found in older buildings and material. In fact, in recent years the US Occupational Health and Safety Administration (OSHA)has estimated that over one million Americans working in the construction and industrial fields are exposed to asbestos on the job. There are several things you can do to protect yourself against exposure. If you feel that your workplace contains asbestos, there are protective measures in place to help you that include protective equipment, work practices, and safety measures. You can contact your employer as well as OSHA for more information. If you feel that asbestos may be in your home, it is recommended that you call a professional and have the property inspected.